"Hopefully we'll be making that movie this summer," actor Mark Wahlberg tells MTV, talking about the Uncharted movie he's planning with writer/director David O. Russell. Wahlberg would be Uncharted hero Nathan Drake. "DeNiro would be my father." Wahlberg told MTV News' Josh Horowitz that Russell's script, as rumored, is being written with roles for the classic Goodfellas/Raging Bull duo Robert DeNiro and Joe Pesci. Russell's people have been in touch with "Bob," Wahlberg says, and he's personally talked to Pesci, who would play Nathan Drake's uncle. "The idea of it is so off the charts," Wahlberg said, failing to say if his pun was intentional. Nathan Drake's dad and uncle are not characters in the Uncharted games — though the mentor character Sully is who maybe could be an uncle or dad kind of guy. 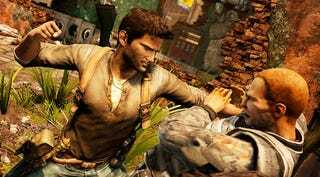 Then again, one doubts Nathan Drake will die 45 times and have to wait for a PlayStation 3 firmware update in his movie. Cinema is not video games.